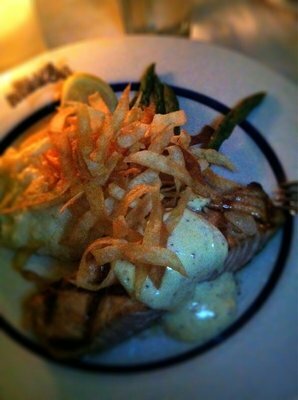 Salmon's one of those fish that's always delicious whether it's baked, seared, smoked or grilled. But add some honey mustard and fried onions and you've got a dinner that will be enjoyed by adults and kids alike. 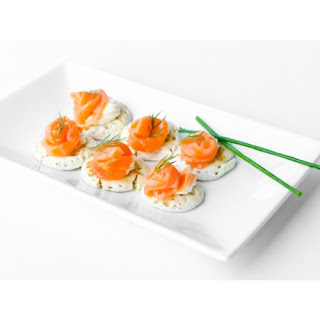 Wow your guests with this decadent and delicious caviar and smoked salmon bilini recipe at your next party. Combine pancake mix with salt, egg, butter, and milk until smooth. Heat a skillet or pancake griddle until hot and brush lightly with butter or spray with cooking spray. Spoon tablespoonfuls of batter onto the hot griddle and cook 1 to 2 minutes or until bubbles begin coming through the top. Flip pancakes and cook an additional 1 to 2 minutes or until golden. Remove blinis and arrange on a platter. Top with creme fraiche, salmon and caviar. 1. Preheat oven to 350°F and line a baking pan with foil. 2. Brush each fillet with honey mustard. Press french-fried onions into salmon so they stick. 3. Bake for 12-15 minutes, or until cooked through. Drizzle with balsamic vinegar and serve. Salmon and citrus are a match made in heaven. You can also use orange juice instead of the lemon juice in this light and healthy recipe. Place 1/4 cup water in a measuring cup and then add the lemon juice and the sugar. Stir the mixture until the sugar has completely dissolved. Place the butter into a large sauté pan over medium-high heat. Sprinkle the salmon on both sides with a few pinches of salt and pepper and then place in the pan. 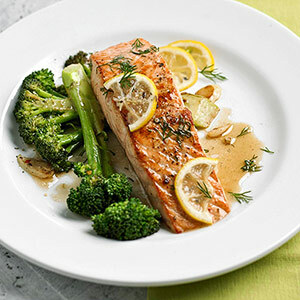 Cook the salmon for 3 minutes, flip, and then top with the lemon juice mixture, the dill and lemon slices. Cook for an additional 6 minutes then place on a serving plate. In the meantime, heat the remaining oil in another sauté pan over medium heat and add the broccoli and the garlic. Sauté the mixture for 9 minutes and then serve with the salmon. Preheat the oven to 350 degrees Fahrenheit. Grease a 2 quart baking dish. Beat the eggs, milk and soup together. Mix in the croutons, salmon, green pepper and onion. Pour into the prepared pan. Sprinkle the cheese on top.